It might not feel like it but spring is just around the corner. Seasons change in the blink of an eye but the issues that come along with it might require a closer look. As spring time rolls around, your property needs care from top to bottom. These types of cleanings can be hazardous to your property and, without the right techniques, hazardous to your body as well. Instead of taking risks with your home or your person, call a Gorilla to help with your spring cleaning. With Spring fast approaching, plant life is kicking back into full gear, meaning growth and shedding of natural debris. There is nowhere for these natural materials to fall than onto your roof and into your gutters. A bit of clutter here and there might not seem like the end of the world but it can definitely lead to larger issues later on. By making your roof and gutters a part of your maintenance routine, you can get ahead of these issues before they appear! Our roof cleaning and moss removal keeps the surface of your roof clean while our gutter cleaning services keep things running smoothly. While our Gorillas might be handling the upper levels of your property, the ground level usually gets the most attention from passersby. Staining happens organically as well as through vandalism. If your cleaning entails a necessary stain removal, our graffiti removal and pressure washing services can help you out. Spotty and streaked windows might have been a problem before but it doesn’t need to be any longer. Our window cleaning services can reach any pane up to four storeys. Over the course of the winter, salt, dust and dirt can accumulate around the sills and frames of windows. Don’t let a seasonal change wreak havoc on your property needlessly. 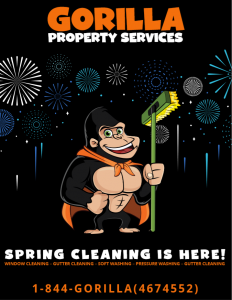 There is a Gorilla around every corner waiting to help get your property looking its best just in time for summer.